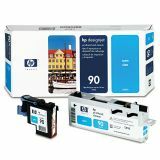 HP 90, (C5055A) Cyan Printhead & Cleaner - HP 90 printheads produce consistently outstanding results from accurate line drawings to photo-quality color images. 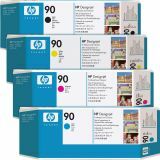 To provide reliable, uninterrupted operation and cost-effective performance, HP 90 printheads are designed for use with HP Designjet 4000, 4000PS, 4020, 4500, and 4520 Series printers, ensuring uncompromised print quality, performance, reliability and long life. You can be sure of consistent results with HP Smart printing technology that makes automatic adjustments to optimize print quality and maximize printhead life. With HP 90 printheads, you get the sharp black line accuracy, rich color and smooth transitions you need to deliver. 10.40" x 1.40" x 4.50"